Customize Your Favorite Metal Coin into a Key Tag with Your Company Name or Logo! Our Metal Coin Key Tags are perfect for corporate events and promotional giveaways. 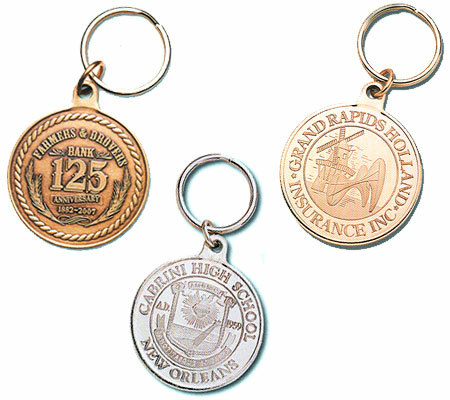 These Custom Metal Coin Key Rings are available in three original styles: Gold, Antique Bronze, and Antique Silver. All Metal Coin Key Chains come fully assembled and individually wrapped. Our Custom Coin Key Tags can be customized with one of our 200 stock designs or with the image of your choice. To order, please call 1-800-233-0828. 4-5 weeks from receipt of camera-ready artwork. For additional information on our Metal Coin Key Tags, or our many other Metal Coins and Tokens please Contact Us at 1-800-233-0828. Feel free to browse our other Bar, Restaurant, Night Club, and Catering Supplies including Wristbands, and Custom Imprinted Coasters.